What a beautiful, vintage card. Love the brown polka dotted ribbon. LOVE it! Beautiful ornament and card! oooohhhh, this is cool! love it! so nostalgic and wonderful! Your card is so pretty! I really like the red buttons and the glittery snowflake. Such a great card :) Thanks for joining us at cupcake this week. Stunning! I love that edged ribbon! Lea, Gorgeous card. Love all of the different textures you have included. i love that stamp set Lea. your card is fantastic. A gorgeous creation, as usual! I LOVE the sparkly snowflake! Gorgeous, Lea! I love *everything* you make, girl! It's been an honor to be on the SD team with you, and I'll continue stalking your blog long after SD's doors close! A stunning Christmas card - love the ornament with the glitzy snowflake! Thanks for playing along with CR84FN! Beautiful card with wonderful colors. I love how your snowflake just sparkles. Thanks for playing along with the Creative Belli Challenge. Oh my, this is a beautiful card. I love the vintage feel. 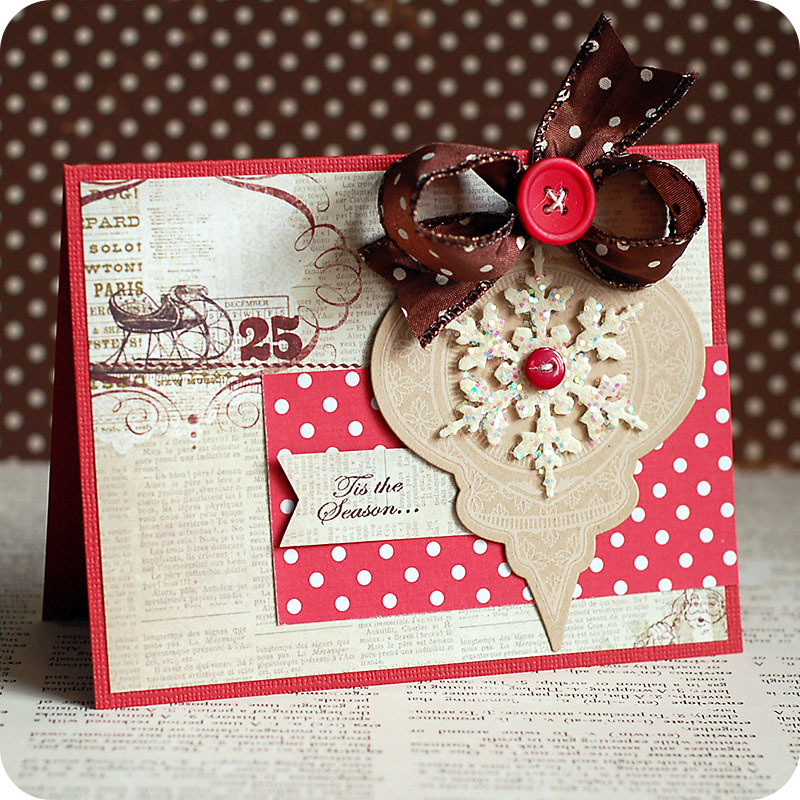 Great dp's, love the ornament die cut and bow, and that sparkly snowflake is amazing! Thanks for joining us at CR84FN! Beautiful!!!! Love your sparkly snowflake! Thanks for playing along with us at Wee Memories. Beautiful card, love the colors you used. Thanks for joining us at Wee Memories Challenge. Stunning Lea!!! WOWZAS! Thanks so much for playing along with CR84FN!